Desert Park Village Area includes six (6) gated subdivisions that are part of the DC Ranch community, plus the Sera Brisa subdivision. This Village has single-family homes and luxury townhomes neighborhood parks and tree-lined streets. Architecture ranges from from bungalow, to ranch-hacienda, to Southwestern. Architectural elements promote front-of-home living, with front porches, and garages positioned to the back of some homes. 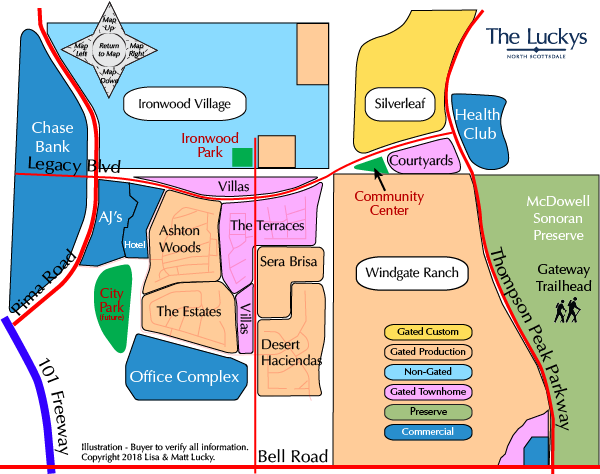 The neighborhoods in Desert Parks Village subdivisions are all a quick walk or bike ride away from the Homestead Community Center, which offers sports courts, a playground, a splash fountain, event facilities, a demonstration kitchen and the Homestead Playhouse community theatre. The hiking and biking trails in the community lead to the Market Street retail center, the Village Health Club, schools, and more. Convenient to downtown Scottsdale (20 minutes) and central Phoenix (35 minutes). Sera Brisa is found on the Desert Park Village Area Map but is not part of DC Ranch community. See all Desert Park Village New. See all Desert Park Village Sold.